The left hand column shows the pulley type. NOTE: Due to the handcrafted nature of our products and updates and improvements to our process, the actual ratio on your wheel or head may vary slightly from what has been calculated and displayed in these tables. Pulleys from other Majacraft wheels will fit on the Aura. 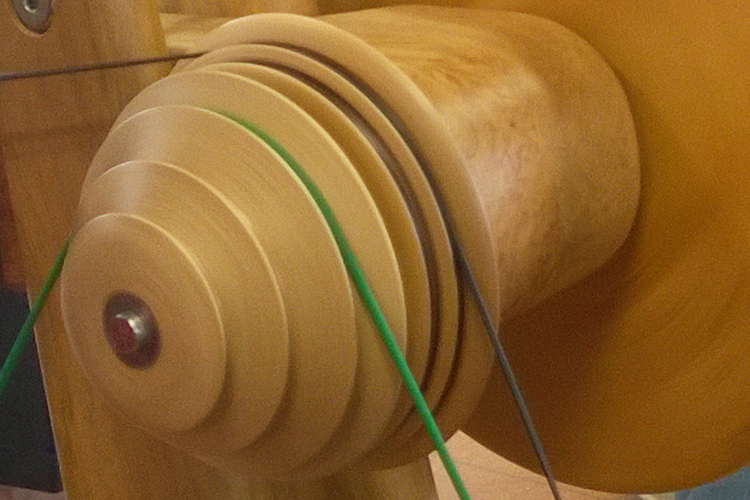 There are many ways to arrange the drive band when the pulley has five grooves and the drive wheel has three grooves. The table below shows the maximum and minimum potential ratios achieveable with our five groove pulleys.